A trail of murder and corruption sets the scene for Jameson & Argenti’s first case! Perfect for fans of Sherlock Holmes, Gangs of New York and Ripper Street. Jack the Ripper’s murderous spree is finally over in London, but has it started again in New York…? A prostitute is found brutally murdered – her body slashed and some of her organs removed. Immediately fear starts to spread. The victim bears the same hallmarks as Jack the Ripper’s recent killing spree in England. Finley Jameson, one of the original English Ripper pathologists, is put on the case and teamed up with Joseph Argenti, one of the new ‘untouchable’ detectives, hand-picked by a New York Mayor eager to fight corruption. With the body count rising and Jameson and Argenti being openly taunted by letters claiming to be written by the killer it seems the ‘Ripper’ rumours could be true. Has he crossed the Atlantic to find fresh killing grounds? Are his taunting letters proof that the cases are linked? Or could this be a deranged copycat killer? 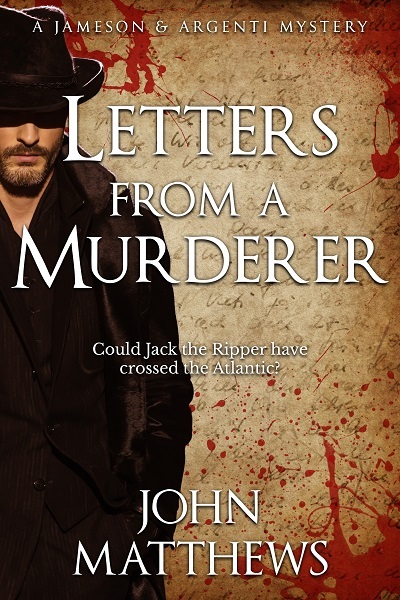 Letters From A Murderer is the first crime thriller in the Jameson & Argenti Victorian mystery series by John Matthews.